Lindsay Lohan's Impromptu Visit To "The Tonight Show"
Lindsay Lohan's interview is set to run Tuesday. Fresh off of her court hearing on Friday, Lindsay Lohan is already back in front of the cameras. The actress, who was sentenced on Friday to 120 days in jail and 480 hours of community service for a probation violation, paid a visit to the set of "The Tonight Show with Jay Leno" on Monday, Access Hollywood has learned. According to a source, Lindsay pre-taped an interview with Jay, which will air on the NBC late night program on Tuesday night. No other details of her appearance were immediately available on Monday afternoon. However, Linsday does appear to have a connection to the show — her attorney, Shawn Chapman Holley, is married to Dorian Holley, who is the lead vocalist for the show's house band, led by Rickey Minor. As previously reported on AccessHollywood.com, Lindsay spent most of the day on Friday in court for a preliminary hearing in her felony grand theft case, in which a Los Angeles-area jewelry store, Kamofie & Co., claimed the actress stole a necklace worth $2,500. During the hearing, Judge Stephanie Sautner sentenced the actress after viewing surveillance video from the store the day Lindsay allegedly took the necklace, ruling it constituted a violation of her probation. 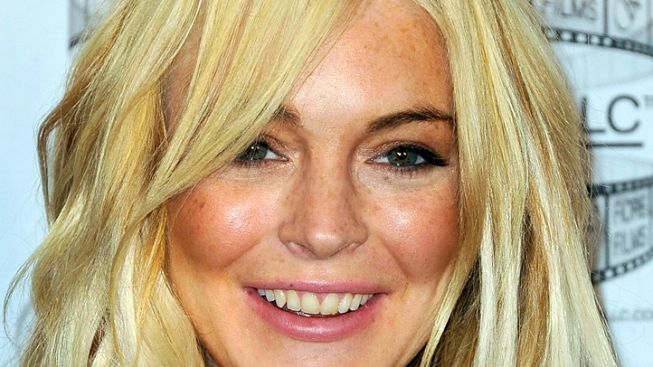 Lindsay spent approximately five hours in custody before posting $75,000 bail and being released under the terms of a "work release" program. She was expected to begin her community service on Monday at a women's shelter in downtown Los Angeles. In addition, Lindsay will also be spending part of her community service working at the LA County morgue.